I am proud to admit that I am a technology geek. If there is a new technology product, website, or tool on the market I love to learn how it works and figure out how to include it in my daily life. As a classroom teacher it is my goal to incorporate as many technology applications as I can effectively. When selecting technology for the classroom it is important to find tools that are appropriate as well as useful for all students. It is important to not expose my students to tools that will require them to pay any fees, while also keep their identity safe on the internet. Tools that live in a cloud are one of my newest technologies that I try to share with as many people as possible. 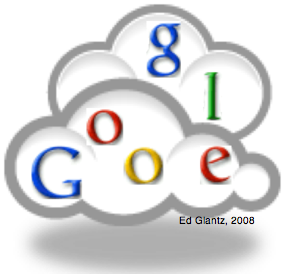 Cloud computing is an amazingly powerful tool since it is often free - thanks Google, as well as available from any location. Cloud computing meets the requirements of being gender, culturally, and socioeconomically sensitive. There are no fees associated with cloud computing, as long as a person has access to a computer their cloud is at their fingertips. For my final project in EDUC 8841 I created a video on how to utilize the power of the cloud. I have not been a subscriber to satellite TV or cable for over five years. I made the choice years ago to get rid of cable for financial reasons, and have not regretted my decision yet! The only downside to not having television programming is that I cannot always keep up when people are talking about television commercials, or the latest reality TV show. But, I have even found a solution to this. Just because I choose not to have cable, does not mean that I don't watch my fair share to TV. I am an avid supporter of Netflix. I have an extensive list of DVDs in my queue, over 100, and have streamed my fair share in a week. I was a member of Netflix before I officially decided to give up cable, and it was one of the supporting reasons why I thought I could survive without cable. As Netflix has enhanced its streaming options, I too have streamed more programs. When it was time for me to find one of the required movie for the module 4, I quickly turned to Netflix. One thought that went through my head was, "what if Netflix doesn't have one of the movie on the list? Where am I going to turn?" Thankfully Netflix didn't let me down. So are DVD and streaming video the next Red Queen, or are they an example of increasing returns? Dr. Thornburg defined an increasing return as "two technologies that hit the market at the same time. By chance, one technology gets locked in and drives the other to extinction" (Laureate Education, 2009). By this definition, the two technologies would need to hit the market at the same time. DVDs became popular in the mid to late 1990s. Streaming video emerged ten years later. Due to the fact that they did not enter the market at the same time they are not an example of an increasing return. Dr. Thornburg defined a Red Queen as "huge competition existing between two technologies, in the process all other competition is left behind" (Laureate Education, 2009). By this definition streaming video would need to be clearly competing with one source for DVDs. At this point in time Netflix is the leader in streaming video, but there are several other sources. iTunes is one place that you can acquire digital versions of media. Also, at this point in time there is not one source for DVDs. People are still choosing between renting them through several different companies, or to purchase them. From my vantage point it seems that at this point in time in regards to McLuhan's tetrad, streaming video is making DVDs obsolete. Within the next five years I would predict that very few people are still watching the video entertainment on DVD, and are turning to the streaming option. I am an avid listener to NPR and Prairie Home Companion is one of my favorite programs. Yesterday morning while I was listening to PHC Garrison Keillor did a rendition of Little Deuce Coupe which can be heard here. It seems that almost every day I hear someone complaining about high gas prices and how much it costs to run their car. I happily chime in with "Glad I own a Prius" and then tell them my most recent gas millage (which is currently climbing to over 48 mgp!). Since one of the themes of the course Emerging and Future Technologies was how one technology takes over for a previous one, I found this song only timely and fitting. In today's society it seems to be more important how many mpg your car gets then how many horsepower the engine has. This rendition of Little Deuce Coupe seemed like an audio version of McLuhan's tetrads. I know the Prius isn't a "cool" car, but it does make a great conversation starter, and it is great on my wallet right now. * This is simply a blog post that seemed to fit for the class that I wanted to share. It is not intended for the Module 5 assignment.